We checked the boxes of several ministries we were interested in knowing more about. We’ve jumped through these hoops at other churches, often receiving little or no-follow up from ministry leaders. To be honest, we’ve learned to keep our expectations low. Thank God this church was different. Let me know where I could find women’s ministry news and info. Asked if I’d like to be included in the online women’s ministry communication. Noted that she was aware I had already signed up for the next Bible study session. Gracefully wove in the mission/purpose of their women’s ministry. 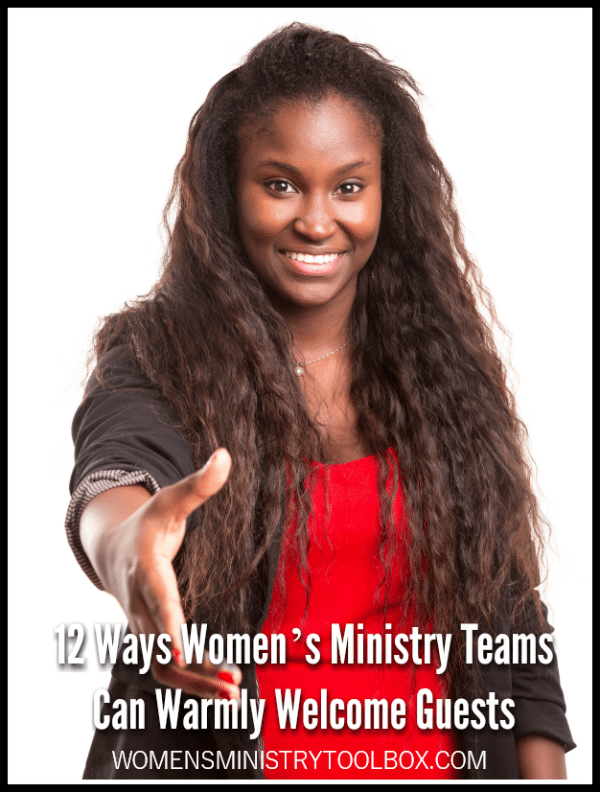 Included details and an invitation to the next women’s ministry event. Invited me to contact her with any questions I had. We know from past experiences, as a member and a guest, that it’s not always easy to be a welcoming church. Please note: Affiliate links follow. When the opportunity arose for me to review Thom S. Rainer’s newest book, Becoming a Welcoming Church, I jumped on it! It’s a quick read, a smaller book with just 100 pages, which shines a bright light on real-life experiences of church guests (the good and the bad) and the blind-bias of church members and leaders. I’ve been locked out of the sanctuary during a Sunday morning service. Begged repeatedly for weeks on end to be added to the elusive Pastor’s weekly email list. Were ejected from our seats at the Christmas service because we had mistakenly sat in the section for pregnant mothers and senior adults. Whether folks are guests at your Sunday morning worship service, Bible study, or women’s ministry event, we can all play a part in making certain everyone who walks through those doors has the best experience possible. Just as the women’s ministry director did at our most recent church home, we can ensure everyone (and especially women) receives a warm welcome. Almost all of the advice and principles in Becoming a Welcoming Church can be applied to women’s ministry and I want to highlight a few – with my own additions – below. 1. Refuse to participate in holy huddles. 2. When caught up in a holy huddle (it happens), remove oneself to welcome unfamiliar faces. 3. Sit with and near guests, rather than claiming the same seat or pew week after week. 4. Visit with your visitors before service ever begins. 5. Be quick to supply information when it is requested. 6. When a new attendee volunteers, accept their offer and put them to work! 7. Send a welcome email or note to every woman who visits. Invite them to jump into the current Bible study series and give them details about the next couple of upcoming events. 8. Listen and ask questions. Sometimes we smother guests with talk about ourselves or the church. Get to know your guests. Identify their needs. 9. Don’t dismiss those who aren’t new in town. They may not be as connected as you may assume. 10. Issue multiple invitations. Don’t dismiss them if they don’t show at your very next event. Reach out and invite them to the next thing on the calendar. You may need to be persistent, especially if they’ve been wounded at their last church. 11. Create and implement a plan for ensuring new faces are greeted warmly and introduced to others at every single women’s ministry event – one on one, not a whole group introduction. 12. Read Becoming a Welcoming Church together and perform the complete a women’s ministry audit by adapting the Church Facility Audit at the end of the book. Most guests are only going to give you one opportunity to welcome them well. We’ve got to be prepared and ready to roll out the red carpet, so-to-speak, when they show up. If we’re always expecting guests, we’ll always be prepared! If you’re looking for a great read for your women’s ministry team, consider Becoming a Welcoming Church. I’m praying God will open your team’s eyes to see things from a different perspective and that you’ll take action to make any needed changes so that every person feels welcome. Disclosure: I received a copy of Becoming a Welcoming Church in exchange for my honest review. Sandra, I agree – there is a big difference in being friendly and making people feel welcomed and included. Great point! Hope you enjoy the book! There is a big difference in being friendly and making new people feel welcome and included as part of the local body. I find this problem in most churches I have attended. I’m trying to use it to my advantage, believing God is teaching me how to love all people, not just those I know well. Looking forward to reading Thom Rainer’s new book. Thank you for helping us with so many issues in the church today. Carrie, I have no doubt you’re a wonderful greeter! 🙂 Hope the book is a blessing and encouragement to you! Allyson, thank you for your comments. Praying each woman God sends your way will feel welcome! These are great suggestions and I can tell that it would make a huge difference to someone visiting and trying to get connected. I am going to make note of these for sure. Thanks for sharing!